When persistent leaks in both the kitchen area and the office- administration area of the Universalist Unitarian Church in Muncie Indiana threaten to damage the walls and ceiling the congregation knew the flat roof must be repaired. The progressive church tasked one of it members who had faithfully maintained and watched over the facility for many years to investigate possible flat roofing solutions that would stop the leaks permanently but also fit into there operation budget. The church's congregation also had a strong desire to reduce their energy consumption and create a smaller energy footprint through the use of roof mounted solar panels and before that could happen the flat roof needed to be sound and leak free for at least the next twenty years. 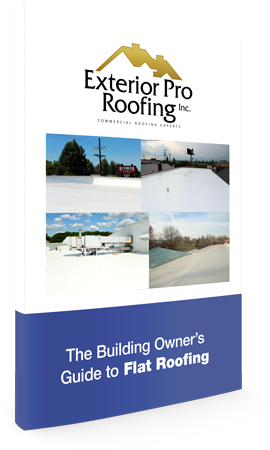 As the board member in charge of finding an Indiana roofing contractor began his search he interviewed several companies for the job and listened to a variety of different flat roof repair options. It was during this process that the church became aware of Exterior Pro Roofing and one of it’s best flat roof repair methods, the PVC Recover. Exterior Pro was invited out to measure the roof, generate budget numbers and show how it’s flat roof recovery system would work for the church. The existing roof was a hot tar style that had begun to leak in more and more places and the only repair method was to apply more tar and hope it solves the leaks. However, the existing flat roof wasn't totally spent and while it was leaking the insulation underneath the hot tar roof wasn't saturated or wet. Exterior Pro suggested the church not to tear off the existing roof but instead recover it with a PVC recovery system. Not only would the new PVC roofing last for the next 20 years and keep the building dry, it was also a great fit for the solar panel project. As it turns out the PVC flat roof recover by Exterior Pro was also the least expensive flat roof repair option. Being able to recover the existing roof saved the expense, disruption, and mess of a tear off and greatly helps control flat roof repair cost. 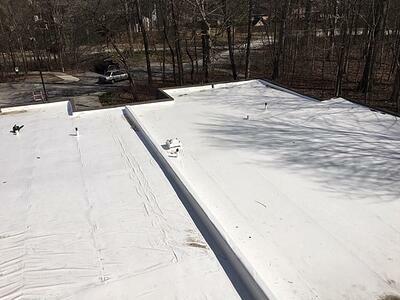 The new PVC membrane was installed by a fast working crew of 10 from Exterior Pro in about 4 days. 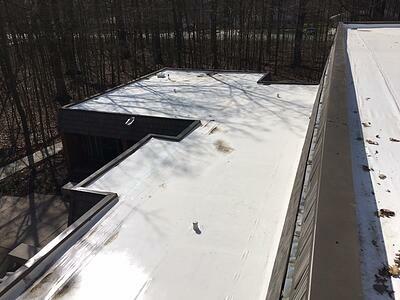 In addition to the 20 year flat roof the church also received an additional 1/2" of insulation and the existing scuppers were fitted with new metal compatible with the PVC roofing. The roof drains on the building were also re-done. 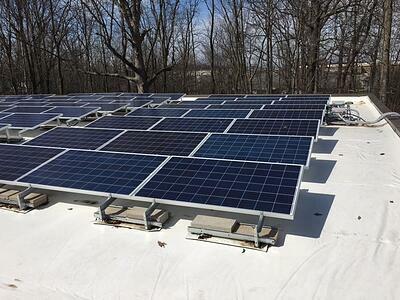 Once the new, white, PVC roofing was installed the project was ready to have solar panels set in place and wired into the churches electrical panel. 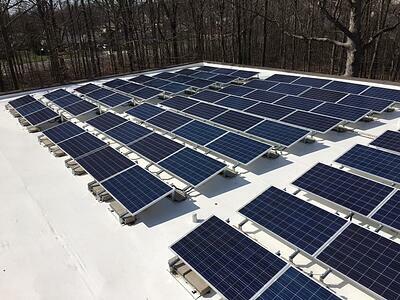 The new solar panels were set on stands which are held in place using concrete blocks. This style of attachment is called ballasted. An additional piece of roofing membrane was placed under the ballast tray that holds the block and under the feet of the solar panel. After the solar panel company had finished it’s work Exterior Pro returned to the church to make sure the roof was in good shape after the solar panel were installed. 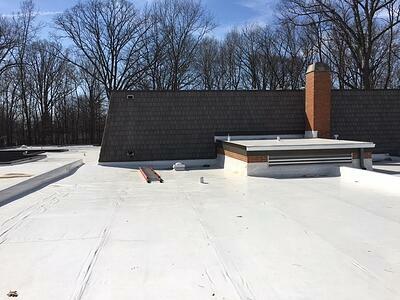 The 20 year flat roof warranty was issued to the church and this Muncie Indiana flat roof repair project was complete.